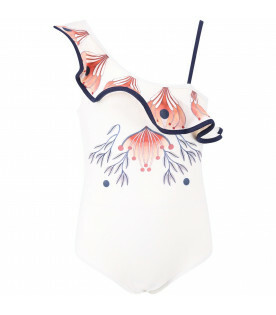 Color: Multicolor -Description: Colorful swimsuit, embellished with white rubbred logo, on the front. - Details: 80% Polyamide 20% Elastan. Machine wash at 30°C. 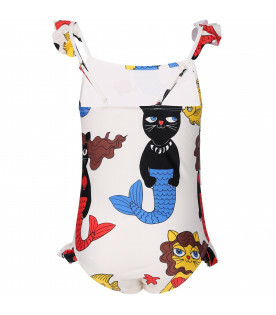 Color: Ivory -Description: Ivory swimsuit with adjustable shoulder straps, emebllished with colorful all-over cat mermaid and fishies and ruffles. -Details: 78% Polyamide 22% Elastan. Machine wash at 40°C. 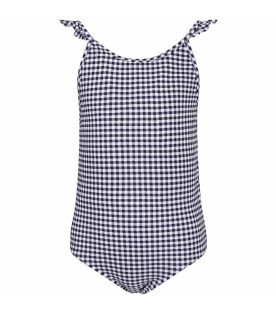 Color: White and blue -Description: White and blue checked swimsuit. -Details: 79% Nylon 21% Elastan. Machine wash at 30°C. Color: White and pink -Description: White and pink checked bikini. -Details: 79% Nylon 21% Elastan. Machine wash at 30°C. 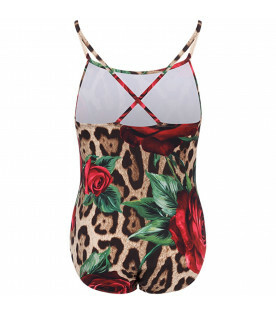 Color: Multicolor -Description: Animalier print swimsuit, embellished with red all-over roses and silver metalli logo, applied on the front. -Details: 85% Polyammide 15% Elastan. 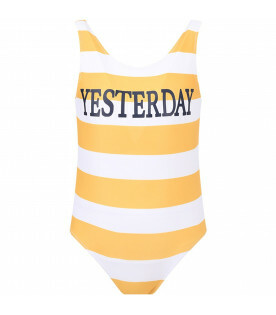 Hand wash.
Color: White and yellow -Description: White and yellow striped swimsuit, with black ''Yesterday'' writing, on the front. -Details: 80% Polyamide 20% Elastan. Machine wash at 30°C. Color: Blue -Description: Blue bikini with fucshia ''Friday'' writing, on the front. -Details: 80% Polyamide 20% Elastan. Machine wash at 30°C. Color: Purple -Description: Purple bikini with turquoise ''Thursday'' writing, on the front. -Details: 80% Polyamide 20% Elastan. Machine wash at 30°C. 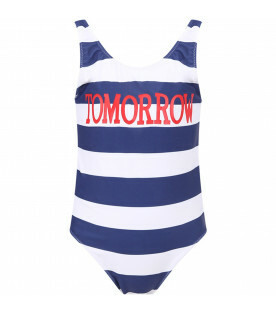 Color: White and blue -Description: White and blue striped swimsuit, with red ''Tomorrow'' writing, on the front. -Details: 80% Polyamide 20% Elastan. Machine wash at 30°C. Color: Turquoise -Description: Turquoise bikini with green ''Tuesday'' writing, on the front. -Details: 80% Polyamide 20% Elastan. Machine wash at 30°C. 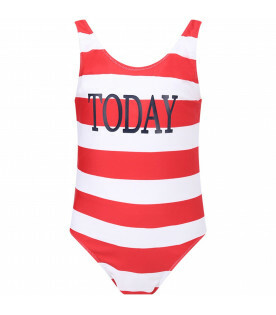 Color: White and red -Description: White and red striped swimsuit, with black ''Today'' writing, on the front. -Details: 80% Polyamide 20% Elastan. Machine wash at 30°C. Color: Neon yellow -Description: Neon yellow bikini with fucshia ''Monday'' writing, on the front. -Details: 80% Polyamide 20% Elastan. Machine wash at 30°C. Color: Fucshia -Description: Fucshia bikini with blue ''Saturday'' writing, on the front. -Details: 80% Polyamide 20% Elastan. Machine wash at 30°C. Color: Pink -Description: Pink bikini with turquoise ''Wednesday'' writing, on the front. -Details: 80% Polyamide 20% Elastan. Machine wash at 30°C. Color: Blue -Description: Blue bikini with neon yellow ''Sunday'' writing, on the front. -Details: 80% Polyamide 20% Elastan. Machine wash at 30°C. 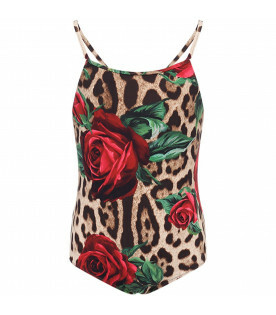 Color: Multicolor - Description: Animalier print bikini, embellished with red all-over roses and gold metallic logo, applied on the front. -Details: 85% Polyammide 15% Elastan. 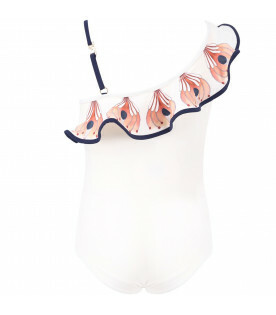 Hand wash.
Color: Multicolor -Description: Colorful swimsuit, embellished with pom-pom and fucshia lurex ruffles. - Details: 80% Polyester 20% Elastan. Machine wash at 30°C. 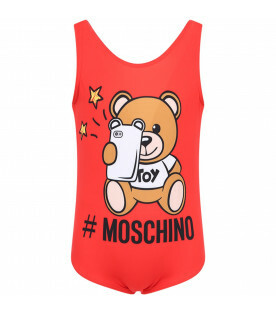 Color: Red -Description: Red swimsuit, embellished with colorful Teddy Bear with telephone and black logo, on the front. - Details: 77% Polyester 23% Elastan. Machine wash at 30°C. Color: White -Description: White bikini embellished with black logo, on the front, white ruffles on the sid slip, and all-over print with Teddy Bear and red hearts. - Details: 77% Polyester 23% Elastan. Machine wash at 30°C. Color: Black -Description: Black swimsuit, embellished with white stripe with black logo, in contrasting. -Details: 82% Polyamide 18% Elastan. Machine wash at 30°C. Color: Black -Description: Black bikini, embellished with red elastic with white logo. -Details: 80% Polyamide 20% Elastan. Machine wash at 30°C. 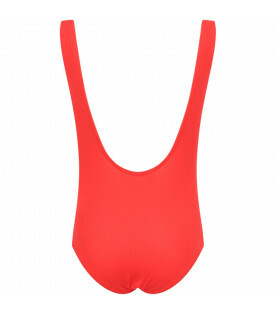 Color: Black -Description: Black swimsuit with white elasticized braces, embellished with white and red rubbred logo, on the front. -Details: 80% Polyamide 20% Elastan. Machine wash at 30°C. Color: Multicolor -Description: White, black and red bikini with iconic logo on the lower band of the top and on the back. -Details: 80% Polyamide 20% Elastan. Machine wash at 30°C. 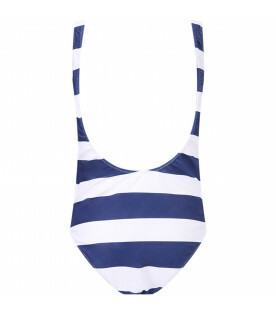 Color: White -Description: White swimsuit, with blue trimming and ruffles, on the front and on the back. It is embellished with colorful print, on the front and on the back. -Details: 80% Polyamide 20% Elastan. Machine wash at 30°C. Color: White -Description: White bikini with adjustable braces, mbellished with gold all-over horses and gold metallic logo, on the back. -Details: 80% Polyamide 20% Elastan. Machine wash at 30°C. 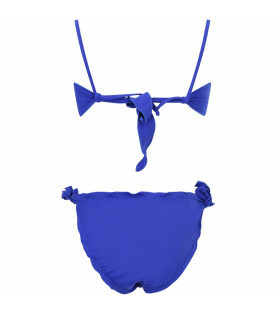 Color: Blue -Description: Blue bikini, embeellished with colorful all-over flowers with gold details. - Details: 80% Polyamide 20% Elastan. Machine wash at 30°C. 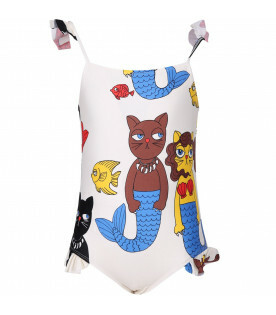 Color: Neon yellow -Description: Neon yellow swimsuit, with colorful rubbred logos, on the front. -Details: 80% Polyamide 20% Elastan. Machine wash at 30°C. Color: Black and fuchsia -Description: Black bikini with inside fucshia, embellished with colorful logos, on the front. -Details: 80% Polyamide 20% Elastan. Machine wash at 30°C. 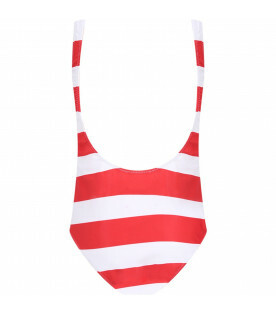 Color: Red -Description: Red bikini, embellished with classic checked pattern details. -Details: 80% Polyamide 20% Elastan. Machine wash at 30°C. 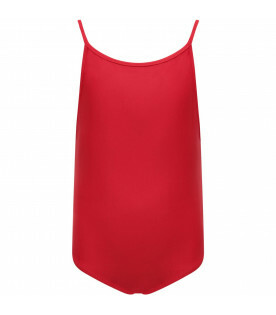 Color: Red -Description: Red swimsuit, embellished with classic checked pattern details. -Details: 80% Polyamide 20% Elastan. Machine wash at 30°C. 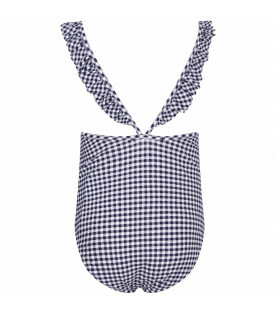 Color: Blue -Description: Blue bikini, embellished with classic checked pattern details. -Details: 80% Polyamide 20% Elastan. Machine wash at 30°C.